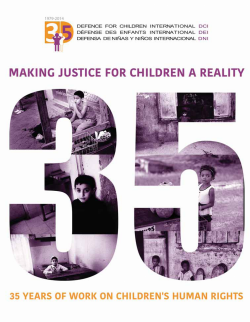 For the celebration of the 35th anniversary of Defence for Children International in 2014 we made a magazine. 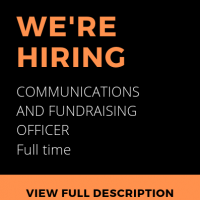 As a way of paying tribute to the work carried out by child rights advocates of the Defence for Children, DCI, Movement, a variety of images from the mass of newsletters published by the organisation over the past 35 years has been put together, in a sort of visual organisational biography. DCI’s history is made up of many great achievements and also considerable challenges. We have gone through some difficult moments, but always managed to resurge thanks to the joint efforts of national sections on the ground and the International Secretariat in Geneva, which all share and work towards the fulfilment of the principles enshrined in the United Nations Convention on the Rights of the Child (UNCRC), its Optional protocols and other relevant international human rights standards. DCI was founded in 1979, in Geneva, and worked on the drafting of the UNCRC. Currently it is composed of more than 45 national sections and associated members worldwide. While going through this magazine you will learn of the specific child rights areas where DCI has been diligently working on since its inception.The power of working within such a strong and dedicated global network is key to DCI’s success. DCI national sections work within their respective countries to generate sustainable changes within the local community, bringing children’s human rights to the forefront of agendas and making sure that children are treated as human right holders. 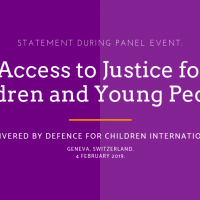 Presently DCI, at the global level, holds justice for children and in particular children involved in the justice system as its overarching priority. It is to them, and to all those that today are working hard to uphold children’s rights worldwide within the DCI Movement, that this magazine is dedicated, with the hope that our shared struggle will not cease until all children around the world truly enjoy their fundamental human rights. Click here to read the 35 years anniversary magazine.